Designed for carbureted 302ci Ford V8s with EGR. This intake manifold is for 302 4-V V8s; 1983-85. Replaces the stock 4V EGR manifold using the stock 4V adapter. Can be adapted for 4V use by using Edelbrock's 4V EGR plate p/n 350-8053 and the OEM EGR valve and gasket. Edelbrock's EGR adapter kit p/n 350-8017 and Ford p/n E4ZZ9A-589E spacer may be substituted for p/n 350-8053 EGR plate (1983-85 H.O. Mustangs/Capris come with this Ford spacer). For 4V off-highway non-EGR applications, use Edelbrock's carb spacer p/n 350-8714. Aftermarket 4-bbl. carbs are not compatible with Automatic Overdrive Transmission (AOD). 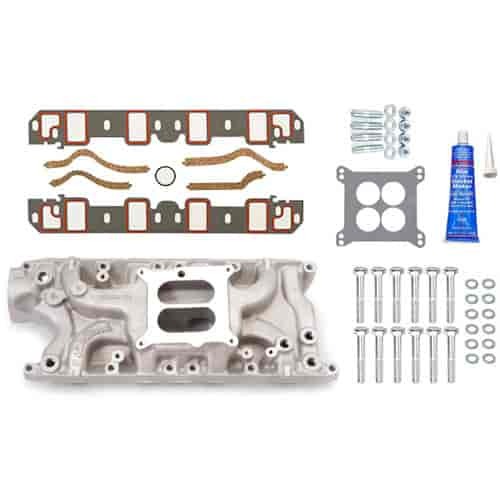 this intake manifold includes gaskets & 4-bbl plate p/n 350-8017 for sealing of OEM EGR plate & carb. Manifold height without EGR plates installed: (A) 3.13'' , (B) 4.31''; Carb Pad Height: 3.72"
Manifold height with EGR plates installed: (A) 4.00'' , (B) 5.19''; Carb Pad Height: 4.59"
Click here to determine carburetor pad height. use automatic transmission rod extension kit p/n 350-8011 (if necessary).